The Cleveland MSA is undergoing significant changes in 2011 and with those changes the Cleveland hotel market hopes that the new developments will act as a catalyst for a renewed interest in downtown hotels. The Cleveland lodging market suffered declines from 2008 and 2009, but rebounded with increased occupancy in 2010. Figures for year-to-date 2011 sh ow that Cleveland still has some work to do to recover from the economic downturn of the past several years. New developments, like the downtown casino project, the Medical Mart and Convention Center, and the redevelopment of the east bank of the flats offer Cleveland the opportunity to revitalize its hotel market, and make it a destination city where hotels can thrive. According to Smith Travel Research, a Hendersonville, Tennessee research firm, the Cleveland MSA offers 189 hotels with over 21,600 guest rooms. The following chart shows the historical lodging performance for Cleveland. 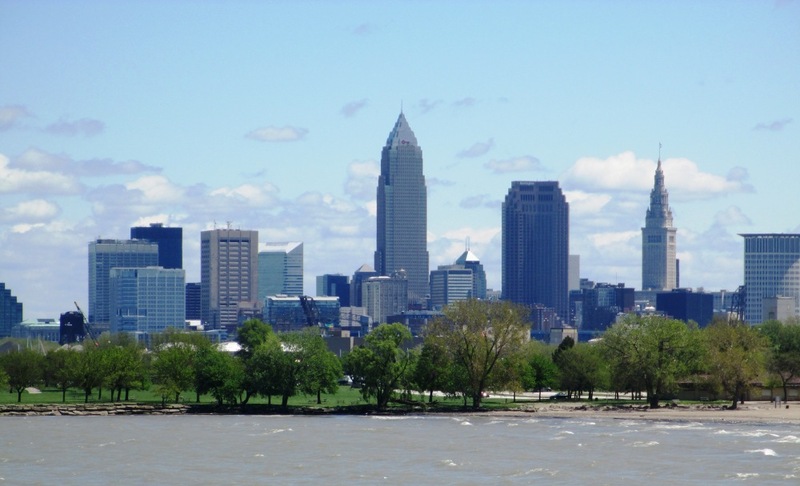 The growth in occupancy in 2010 in the Cleveland MSA is supported by the limited amount of new supply of competitive hotel rooms in the market. While a handful of properties have opened in suburban communities since 2006, no new properties have opened in downtown Cleveland since 2003. The following table identifies the new properties that have opened in the Cleveland MSA market since 2006. There are a number of major new projects planned in the downtown market as described in the following paragraphs. These projects are anticipated to act as catalysts for the Cleveland hotel market. Dan Gilbert, owner of the Cleveland Cavaliers, is head of the investment group that will own and operate a casino, partnering with Caesar’s Entertainment. Rock Ohio Caesars has negotiated with Forest City Enterprises to locate the casino downtown adjacent to Tower City Center. The casino will operate under the Caesar’s Horseshoe brand. The new casino is expected to have a significant impact on downtown hotels, restaurants, and retail stores. A temporary casino, projected to open in 2012 in the Higbee Building, is currently under construction. The new permanent casino is expected to be completed and open by 2013 or 2014. The location of the new casino in the downtown area is expected to provide additional traffic within Tower City Center and to area hotels. It is also anticipated to provide an additional marketing tool to meeting planners when selling Cleveland as a convention site. In April 2011 it was announced that the development group secured an option to purchase the 206-room Ritz Carlton Cleveland from Forest City Enterprises. If purchased, it allows the casino group to offer a hotel for the casino guests, without adding additional hotel supply to the market. As of May 2011, construction on the temporary casino in the Higbee building has been stopped as the new Governor wants to re-negotiate the tax amounts the state would receive from casino operations. A new $425 million Medical Mart and Convention Center is slated for downtown Cleveland in 2013. The Medical Mart concept is intended to leverage Cleveland’s strong reputation in the health sciences by attracting medical-related events to the city. The Medical Mart facility, to be located at the northeast corner of St. Clair Avenue and Ontario Street on the site of the existing convention center, will be a glass-walled, 200,000 square foot structure with showrooms and meeting space on the ground floor and showrooms of up to 6,500 square feet on the upper floors. The Medical Mart building will connect to the L-shaped 300,000 square foot new construction Convention Center below malls B and C. Ground breaking took place in the fall of 2010. MMPI, operators of the new Medical Mart, announced in April 2011 that they have achieved 63 signed letters of intent from companies and vendors wanting permanent display space, and 35 letters of intent from conferences and conventions. Developer Scott Wolstein has announced a redevelopment plan for the east bank of the Flats, stretching to the edge of the Warehouse District. The $500 million plan calls for 975,000 square feet of office space, an aloft hotel, public park, 1,200-foot boardwalk, and 430 residential units including apartments, lofts, and condominiums. The development would also include a new movie theater, gourmet market, and retail shops. In January 2010, Wolstein’s development team received approval from a Cleveland city review board to begin work on the $270 million first phase of the project, which will include an office building, fitness center, retail stores, and parking. In December 2010, HUD agreed to provide a $30 million loan to the city of Cleveland, and $2 million to Cuyahoga County for financing. The project bagan construction in 2011. The $33 million Greater Cleveland Aquarium is under construction on the West Bank of the Flats in the historic Powerhouse. The Aquarium will offer 70,000 square feet of aquarium exhibits, and an underwater-walk-through experience in the Sea Tube. Phase two of the development is estimated at $40 million and will include a series of glass atriums along the Cuyahoga River. Phase I is anticipated to be open in fall 2011. The following are a number of proposed hotels in the downtown Cleveland area. Renovation of the Tudor Arms Hotel near the Cleveland Clinic into a 157-room Doubletree Hotel with a restaurant and medical bookstore. The project is under construction. It is scheduled to open in July 2011. Courtyard by Marriott, University Circle, Cornell Road and Euclid Avenue will offer 150 rooms. It was approved by the board of zoning appeals in January 2011, and has an anticipated opening Q3 2012. After restoration and renovations, The Cleveland Athletic Club is proposed to convert to a 180-room full-service hotel. The proposed hotel would coccupy floors 2 through 10. The Cleveland Athletic Club would occupy floors 11 through 15. The development would also include a Trader Vic’s Restaurant. A $40 million conversion of the Schofield Building on East 9th Street and Euclid Avenue to a Kimpton Hotel with 140-rooms and 24 luxury apartments is proposed. Floors 2 through 10 will be the hotel, floors 11 through 14 will house the apartments. The project was awarded $5 million in historic tax credits in June 2010. A 200-room hotel in the John Hartness Brown Building on Euclid Avenue submitted plans to the city for review in spring 2011. Developers are working to secure financing. The development also includes 12,000 to 13,000 square feet of ground floor retail space. The sale of the property is not yet complete. Developers anticipate a Spring 2011 closing. Hotel affiliation is not yet determined. The current anticipated opening date is 2013. 150-room aloft hotel is under construction as part of the Flats East Bank Project by developer Scott Wolstein. The Hotel development will have 3,000 square feet of meeting space, lounge, and gym. The project is under construction and anticipated opening is 2013. A hotel is proposed as part of the Huntington Building Renovation at 916 Euclid, but the size and scale are not yet determined. Optima Ventures LLC purchased building in June 2010. Development plans announced in August 2010, indicate the mixed use potential for development of a hotel. Scheduled for opening 2013 or 2014. This project is in the proposal stage of development. The following table summarizes the proposed hotel developments in downtown Cleveland. 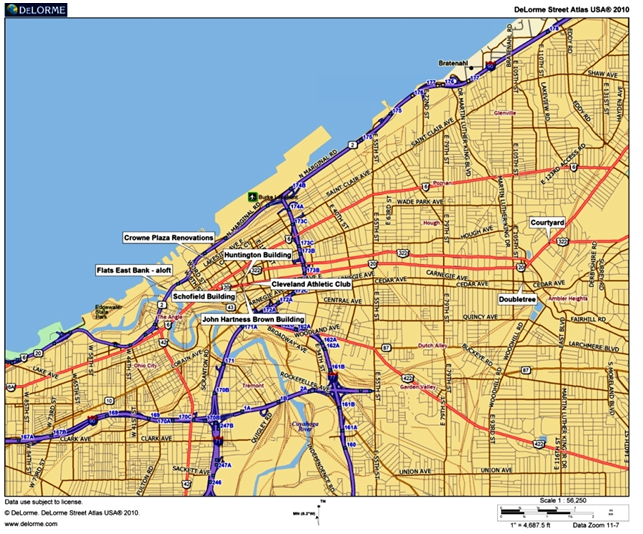 The following map provides the relative locations of the proposed properties in Cleveland. Sage Hospitality and Optima International are in the final stages of purchasing the existing Crowne Plaza for renovation and a possible conversion to a Westin – potentially by early 2013. Beyond the downtown Cleveland area, in May 2011, American Greetings announced the relocation of their headquarters to the lifestyle retail center known as Crocker Park, located in the Cleveland suburb of Westlake. Expansion to Crocker Park is anticipated to include the 700,000 square foot headquarters facility, a new parking garage, new retail space, and a new hotel. The anticipated opening date for the new headquarters is 2014. Eric B. Hansen, AIA, ISHC is the Director of Development Services for Hotel & Leisure Advisors, a national hospitality consulting firm. Mr. Hansen is active in performing appraisals, market feasibility studies, property condition assessments, and impact studies for hotels, resorts, waterparks, golf courses, conference centers, and other leisure properties. As a hospitality consultant with a foundation in consulting, architecture, financial management, and appraisal theory, Mr. Hansen brings well rounded expertise to various H&LA assignments and assists H&LA clients with their pre-development, consulting, and valuation needs.